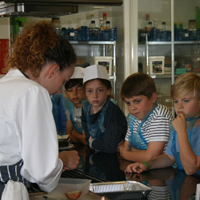 We are passionate about introducing real food and real cooking to children and our children’s cookery lessons designed for 8 – 15 year olds are very popular during the school holidays. 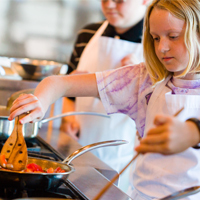 Children work on a fully equipped shared workstation and have their own ingredients to produce a two course meal focusing on a healthy and balanced diet. 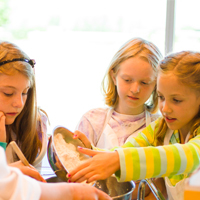 Our young chefs will eat some of their creations in class and take some of their culinary delights home to share with the rest of the family. They will also receive a recipe card so dishes can be easily replicated at home. Courses last approximately 3 hours. 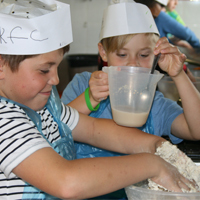 Our children’s courses are great to get children more active in the kitchen and interested in eating a healthy and balanced diet. The classes are fully supervised with DBS checks carried out on staff members running the courses so parents can leave the children in capable hands. We do ask that parents just complete a short registration form before the beginning of the class and of course inform us of any allergies.